I would like to thank Richard Young, The Magic Circle and others who made The Magicians’ Podcast possible. I love listening to podcasts and audiobooks when I’m traveling long distances or running errands. However, there are very few audiobooks devoted to the conjuring arts out there and only a handful of magic podcasts. 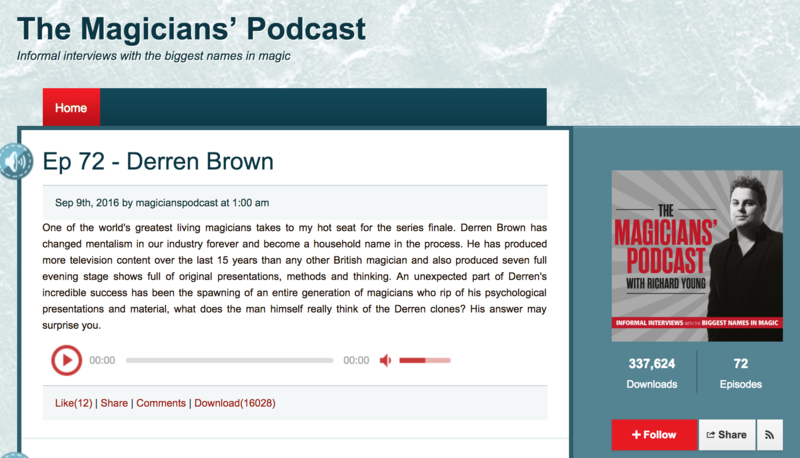 Clicking on the link above will take you to a fascinating 2-hour interview with Darren Brown as well as 72 other episodes. I’ve listened to all of them now and appreciate the diverse perspectives they document from demonstrators, retailers, convention organizers, television writers, producers, performers of all kinds of magic (close-up, parlor and stage) and others. Since Richard Young is based in London, these focus on the UK scene and offer a thumbnail sketch of major players, productions and politics active in that part of the globe from 2015-2016. Check them out and let’s hope that more of this kind of magic-world audio content makes its way into the world.